Colorado School of Mines received a A. "Colorado School of Mines is a small, prestigious, and "very difficult" engineering school where students often "do homework seven days a week." The "predominantly introverted" students at CSM "do math" for fun, or surf their idle hours away on the Internet, or dream about spending the big bonuses from the high-tech employers who are certain to hire them upon graduation." Describe the type of student who should not attend Colorado School of Mines and explain why. Describe the type of student who should attend Colorado School of Mines. Why? What is a typical Colorado School of Mines student like? Describe the type of person that should attend Colorado School of Mines. What are the top 3 reasons someone should attend Colorado School of Mines? What was a typical Colorado School of Mines student like in high school? Describe the type of person that should attend Colorado School of Mines. Best known for mining-related fields but strong in many areas of engineering. One of the most important research institutions in Colorado and a top destination for engineering students. Mines has distinguished itself by developing a curriculum and research program geared towards responsible stewardship of the earth and its resources. In addition to strong education and research programs in traditional fields of science and engineering, Mines is one of a very few institutions in the world having broad expertise in resource exploration, extraction, production and utilization. As such, Mines occupies a unique position among the world's institutions of higher education. What are the top 3 things that students do for fun at Colorado School of Mines? Pretty much the most fun I have is studying and eating out with friends. Campus housing is available for undergraduates. No housing deposit required. Freshman allowed to have car. No pets. 43% of students live on-campus. The average student pays $23,759 for tuition, fees, and other expenses, after grants and scholarships. Total stated tuition is $14,400, in-state and on-campus, before financial aid. Learn more about financial aid at http://inside.mines.edu/financial_aid. Estimate the net price for you at http://inside.mines.edu/npc/npcalc.htm. The typical (median) early career salary of Colorado School of Mines graduates is $66,700, according to Payscale. Colorado School of Mines participates in the NCAA Division II for college athletics. Want more info about Colorado School of Mines? Get free advice from education experts and Noodle community members. What is the date of graduation for undergraduates this year? Do you have information on hotels, etc.? Colorado School of Mines' undergraduate graduation ceremony is scheduled for Friday, May 13 (http://inside.mines.edu/Commencement). When does summer school begin? What is being offered in Geology this summer? Can a non registered student audit a class? 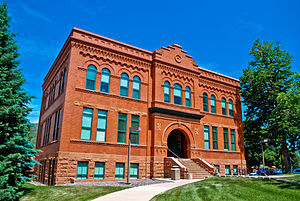 According to the academic calendar on the Registrar's website, summer school at the Colorado School of Mines operates in two sessions, from May 11 to June 19 and from June 22 to July 31.